Rock legends Metallica, Soundgarden and Korn will each headline one night of America's largest and most-acclaimed rock festival. 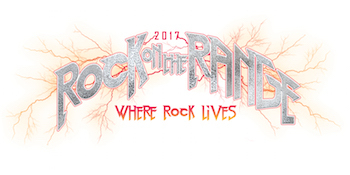 Overall, Rock On The Range 2017—fueled by Monster Energy—will feature over 50 bands performing on three stages, plus rock's favorite comedians in the ROTR Rolling Rock Comedy Tent, The Music Experience, art installations, and unique onsite activities during the three-day weekend. Jonathan Davis of Korn comments, "Rock On The Range is the pinnacle rock festival in America. I always feel that in the crowd and can't wait for our headline set in May. We're gonna come at you with everything we've got — expect a few surprises!" Dexter Holland of The Offspring says, "Great lineup at Rock On The Range this year. The Offspring can't wait to finally be part of it all." "After our record breaking Ten Year Anniversary it was high time to raise the bar and have the world's best rock bands jump over it. 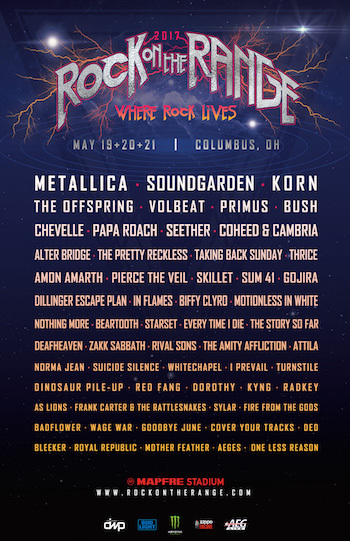 We couldn't be more honored to have Metallica and Soundgarden at Rock On The Range! But why stop there? To have bands such as Korn, Volbeat, Primus, Papa Roach, The Offspring and so many more truly makes this year's ROTR our best one yet. May 19-21 can't come soon enough," says Gary Spivack, ROTR co-executive producer for Danny Wimmer Presents. Rock On The Range celebrated its 10th year in 2016 — and after a decade of setting the standard for American rock festivals, the crown jewel of the World's Loudest Month showed no signs of slowing down, with 120,000 "Rangers" from around the globe descending on MAPFRE Stadium. In 2016, the festival received awards of recognition from both Columbus Mayor Andrew J. Ginther and the City Council, as well as a resolution from the Franklin County Board of Commissioners acknowledging the over $140 million in economic impact the festival has contributed to the city over its 10-year existence.